You will see the selected setting: Outside Temperature or Speedometer km/h (USA)/Speedometer mph (Canada). The speed is shown in km/h (USA)/mph (Canada). display are shown in red. For further information about Adaptive Highbeam Assist, see . You will see the selected setting. brightness to any level from Off to Level 5 (bright). color to SOLAR, NEUTRAL or POLAR. When the Surround Lighting function is activated, the light cone and the area around the vehicle are displayed in red in the multifunction display. Deactivating delayed switch-off of the exterior lighting temporarily: ■ Before leaving the vehicle, turn the SmartKey to position 0 in the ignition lock. • Surround lighting: the exterior lighting remains lit for 40 seconds after unlocking with the SmartKey. 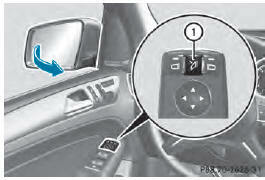 If you start the engine, the surround lighting is switched off and the automatic headlamp mode is activated . If you close all the doors and the tailgate, the exterior lighting goes off after 5 seconds. If you activate the Interior Lighting Delay function, the interior lighting remains on for 20seconds after you remove the SmartKey from the ignition lock. If you activate the Automatic Door Lock function, the vehicle is centrally locked above a speed of around 9 mph (15 km/h). Radar Sensor (See Oper. Manual):. You will see the selected setting: Enabled or Disabled. button on the steering wheel to select the Sett. menu. When the Belt Adjustment function is activated, the vehicle seat belt is displayed in red in the multifunction display. For further information on belt adjustment, see . This function is only available on vehicles with the memory function . If you have switched the Auto. Mirror Folding on and you fold the exterior mirrors in using button 1 , they will not fold out automatically . The Reset All Settings? message appears. ■ Press to confirm the selection. If you select Yes, the multifunction display shows a confirmation message. For safety reasons, the Daytime Running Lights function in the Lights submenu is only reset if the vehicle is stationary.